Since its inception 50 years ago, Calvary Lutheran Church in Ruskin has been a steady beacon of hope to thousands of residents going through tough times. Revealing the love of Christ through service to others is one of the faith’s guiding principles, and its annual Thanks for Giving food outreach is among its most impactful. Jose Guerra, of Ruskin, accepts a Thanksgiving ham from volunteer Margie Griffith during Calvary Lutheran Church’s annual Thanks for Giving event Nov. 20 at Community Cupboard. Waiting in line for a bag filled with staples and a ham or turkey for their Thanksgiving meal, many acknowledged their need for such help. 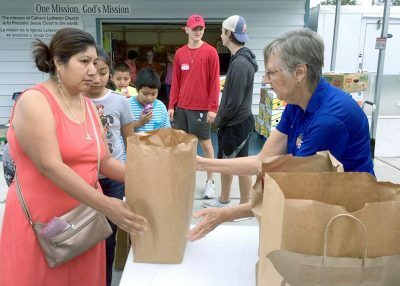 Church and community volunteers received much in the giving. Over time, the food pantry was moved to a bookshelf in a room used for fellowship and Bible study, and then to a double closet with shelves. “In the old days, we even heated up food on a cold day, when people stopped by,” said Sabo, a 40-year member of the church. Followed by her three children, Carmela Marquez accepts a free bag of Thanksgiving staples from a Community Cupboard volunteer at Thanks for Giving Nov. 20. Thanks for Giving, in its current format, began in 2005, when Community Cupboard moved to a small trailer on College Avenue East, and Angel Attic was founded to fund it. The two operations shared space there for three years, until the church built the 900-square-foot building area residents now recognize as the cupboard. It was used as a sorting room for Angel Attic and a storage room and distribution site for the cupboard until the church built a 4,000-square-foot structure to house the thrift store in 2013. Initially 25 to 50 bags and a gift card for a turkey or ham was offered to residents in need at Thanks for Giving. As word got out about the outreach, the number of people needing assistance grew exponentially. This year, Thanksgiving food was provided to just under 700 families (representing an estimated 2,700 individuals) and 40 homeless. Calvary Lutheran Church distributes empty paper shopping bags with a list of needed items and donation envelope to its members near the end of October each year. Numerous community groups and individual residents, co-workers and neighbors began taking empty shopping bags over time. 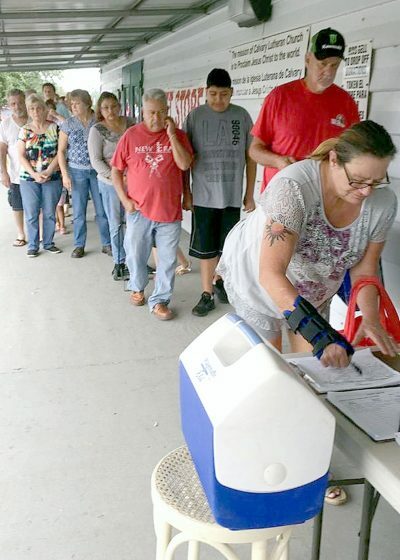 Folks line up to register for Thanks for Giving at Community Cupboard Nov. 20. All that’s required is a photo ID with the recipient’s name and address on it. 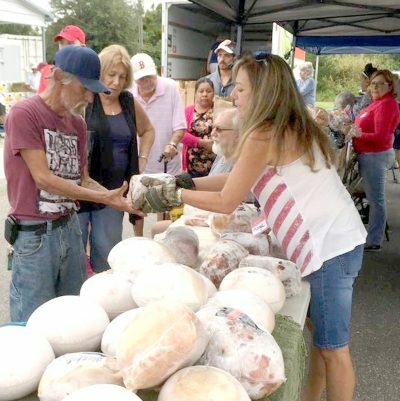 The church also purchases food items from Feeding Tampa Bay at 18 cents per pound or from Save-A-Lot in Sun City Center, and the community of Waterset donates turkeys. Other meat items are purchased through cash donations. During this year’s effort, between $5,000 and $6,000 was received above and beyond donations of food items, Sabo said. Prior to the event, volunteers sort food items and stuff the paper bags. On the day of the event, others hand out the bags or work the tables where the bread, cookies and meat items are placed. Still others direct traffic or register the folks who turn out. The only requirements for the program are a photo ID with a name and address, she said. There is no income verification. If you’d like to be involved in Thanks for Giving by filling a bag, making a donation or volunteering your time, email Sabo at paula@calvaryalive.org. For more information on Calvary Lutheran Church and its ministries, visit www.calvarylutheranchurch.net.